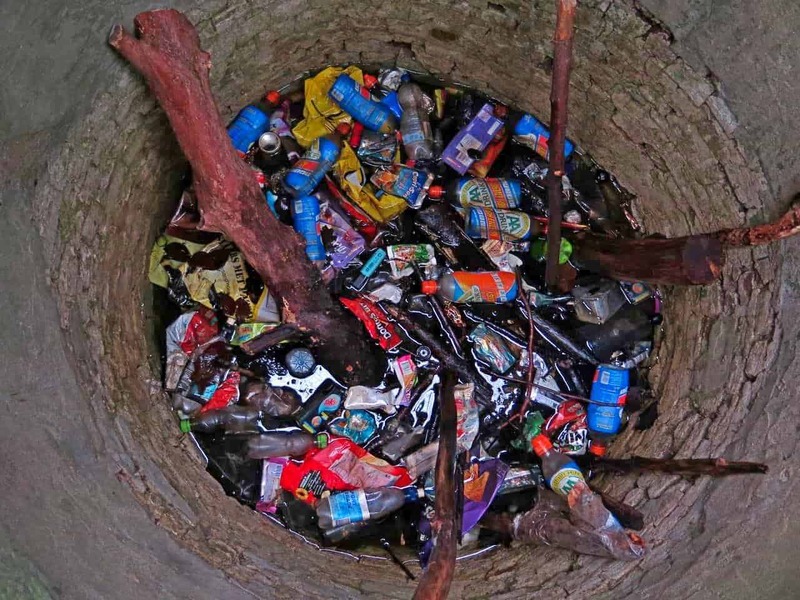 Back in the spring of 2017 I noticed the alarmingly large amount of trash in the monumental well of Castle “Oud Poelgeest” in Oegstgeest, the Netherlands. Contacting the authorities didn’t resolve the issue and the well was too deep to reach the debris. The Tengnagel is a narrow headland, just 700 metres long, situated in the Kagerplassen, close to Leiden in the Netherlands. The circumference is one and a half kilometres (close to a mile), the watersides consist of basalt. 30 July 2017 I started to remove all litter washed ashore. Since then I’m repeating these sessions every so many weeks to get an impression of the influx of new garbage and whether the amount decreases over time. On this page are the results of each session, including pictures. Provisional conclusion: regular removal of all litter does not induce a decrease of the amount of litter. However, I may intercept garbage that would normally end up in sea. Not only the scale model, but also the actual house will be hand-sculpted! Building a house in such a way that it is an enrichment for its surroundings, for biodiversity and its occupants. There are no technical limitations which prohibit nature embedded dwellings. Stunning examples are given in The Hand-Sculpted House (ordering info at the bottom of this page), which will be used as a guideline for the story below. This book is about building techniques according to deep ecology concepts, but also provides a powerful motivation why the human race really needs to start doing things in a different way. Not only in home construction. Before delving into the uplifting world of hand-shaped houses, first an introduction in the conventional methods of home construction. Superb infographic by Grain, a non-profit organisation that supports small farmers and social movements for community-controlled and biodiversity-based food systems. Now, local food is always a good idea, but you’ll really get motivated after reading the current situation in industrial farming and dito distribution. Issues with the food system on page one, solutions on page two. Spoiler alert: you and me are the key to positive change. Over two kilograms of atlas for free! The worldwide catastrophic soil degradation will lead in a few decades to a complete loss of agricultural land. A totally different way of farming and economic thinking is paramount. Now, we can go sit and wait for policymakers to make a move, but you can diminish your share in habitat destruction today. Hint: buying organic and stop consuming animal products is a giant leap forward. The atlas will help to motivate you with a wealth of information. Indeed, food security is mainly a concern for humanity. In a wider perspective we’re talking about the loss of biotopes and biodiversity at a scale never observed by man. Rose hips contain a variety of minerals like potassium, phosphorus, iron, boron, chloride, copper, magnesium, silicon, sulphur and zinc. Yes, nutrients which are often deficient in our diet. Rose hips are also high in vitamins and when I’m at a safe distance from agriculture and traffic I often chew a couple away. Not necessarily the best taste you can imagine, but a healthy habit for sure. Also interesting are the somewhat softer rose hips. A bit the same stage as when you eat medlars. They are then puree-like, really sweet and tasty. I experienced no adverse impact from the consumption of rose hips at this stage. And who knows what the beneficial effects are! With tea, you also get a dose of minerals. However, vitamins and the many phytonutrients will be lost. I put the rose hips after picking in a dark, warm, dry place to dry. That way they will not have the chance of getting moldy or anything. After a week they are wrinkling, but not quite dry yet. I throw them in the blender and grind them to the stage as shown on the photo. Smells delicious! I spread the grit out and let it dry for a while, seeds included. Reportedly, this makes the tea somewhat bitter. The alternative is cutting the rose hips in half before grinding and remove the seeds. I didn’t notice any bitter taste, but that may be because the blender leaves the seeds intact. Yesterday, The Plastic Soup Surfer and surfshaper Bram Hoogendijk crossed the North Sea with their hydrofoil kite-surfboards. With their journey of 176 kilometres from Scheveningen (Netherlands) to Lowestoft (England) they want to draw attention to the ongoing plastic pollution of the sea. Also, they press for a more elaborate deposit scheme to minimise littering. All info on the site van de Plastic Soup Surfer. Consider making a donation to enable their beautiful initiatives in the future! Brambles have an important ecological function, for example as hideaway for birds and small mammals. However, due to high nitrogen deposits from agricultural activities, plants like brambles and nettles start to overgrow other vegetation. Volunteers have to remove the vegetation over and over again. But how about the alternative? Why not using your creativity and start weaving with brambles! Due to high nitrogen deposits from agricultural activities, plants like brambles and nettles tend to overgrow other vegetation. However, nettles do have useful properties. Leaves can be used in salads and smoothies and the seeds can be eaten directly from the plant or used dry in all kinds of dishes. Nettle seeds don’t have a strong flavour, so you can use them without worrying about dominating your dish. An easy and fast way of harvesting seeds is shown in the video below. This video shows how we untied this creature in distress. What it doesn’t show is the remarkable circumstances by which I stumbled upon it. Without sounding woolly it really felt I was guided to it… We’re talking about 34 square kilometres of nature. And the deer was nowhere near a path. You’re allowed to wander off the trails in this area, which almost nobody actually does. But I did. It also means you’ll see places were probably no-one had been for a long time, perhaps years. That’s indeed quite exceptional for our crowded, little country. Anyway, while I was strolling, suddenly this deer jumps up while I passed it closely. And the rest of the story… Is in the video below.